Mirror Technologies Private Limited a multidisciplinary organization engaged with embedded commodity development and serving various business solutions such as Embedded System Product Development, Software services, Android development, Web development. 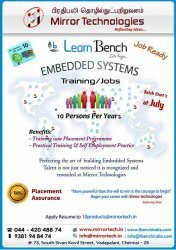 Learn Bench India is the partition of Mirror Technologies Pvt Ltd committed to provide training for graduates, conducting placement job assured training programs for 10 freshers every year. Successful placement for the last 2 Years…..
Are you looking Job in MNC core companies? Are you ready to Spend 8 months Duration and Rs 75000? Everything is Practical…. Come and join with us..
5. To offer a complete Product Development Engineer to MNC s such as Robert Bosch, Visteon, Hcl, Caterpillar, Delphi, John Deere, Volvo, hcl, honeywell, Mind Tree….etc. At the end of course, every candidate will be placed at top MNC’s with the package of min 20k /month. Hurry up Limited seats ! Mirror Technologies Pvt Ltd .